This is actually a continuation of a previous post on Thailand’s main international airport. 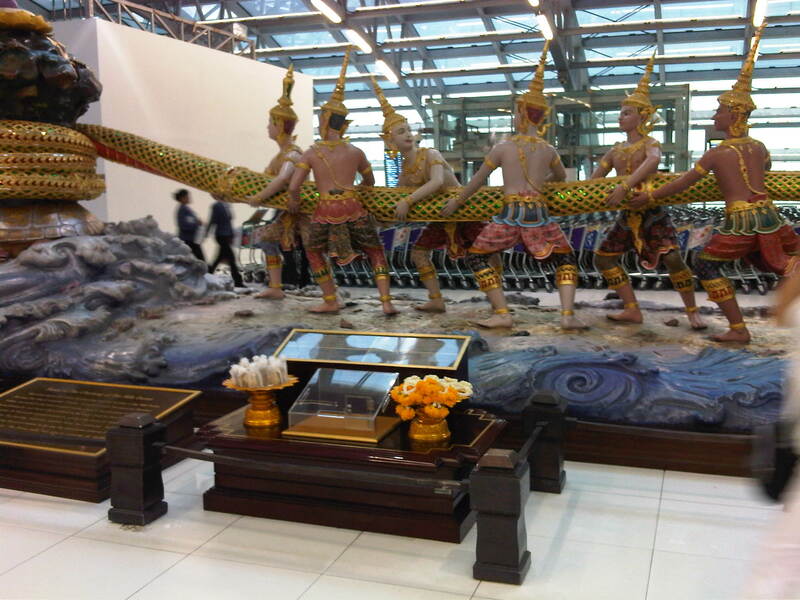 In the previous post, I featured checking-in at Suvarnabhumi International Airport. In an even earlier post, airport railway access was featured. Following are photos I’ve taken while exploring the airport again eight years after my last visit to Bangkok. After clearing immigration, the traveler is greeted by this attraction, presenting additional photo opportunities to tourists. The scene is is religious in nature and there is an explanation on a plaque in front and at the center of the life-size display. Unfortunately, I wasn’t able to take a photo of the plaque. Duty free shops line both sides of the corridor to the boarding gates. Tourists will be happy to find more photo opportunities as they explore the airport or walk towards their boarding gates. This gazebo-like feature in the airport is a curiosity given its contrast against backdrop of the modern interiors of the airport. Natural features in the airport include these palm trees serving as sentinels to the escalators to the boarding gates. Cavernous terminal is emphasized in this photo taken during my descent via escalator. The moving walkway helps people get to their boarding gates, which may be located at the farther parts of this linear airport terminal layout. The departure level is on the upper level concourse so as to separate arriving and departing passengers. The photo gives a view of the lower level corridor for arriving passengers. The terminal building is linear and requires several moving walkways. 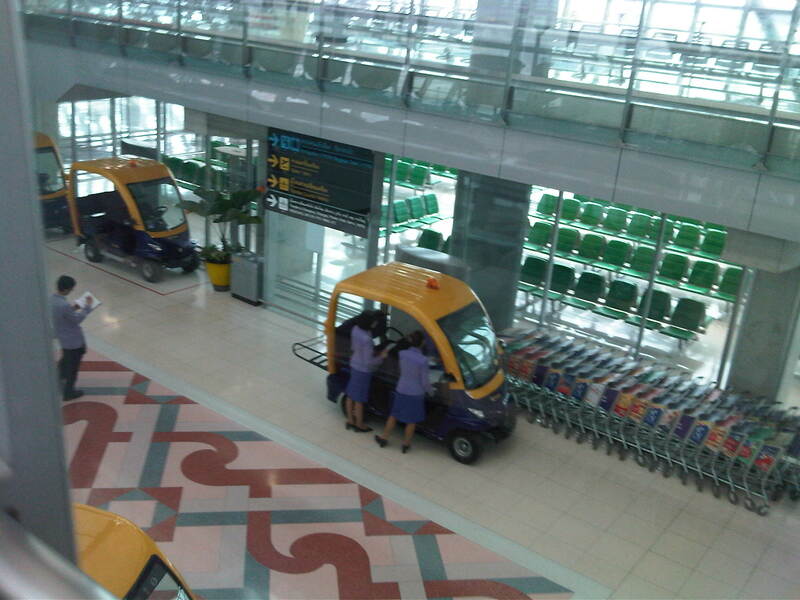 There are electric service vehicles at the airport but these are mainly for the use of airport staff. Another photo opp feature at the airport for last minute pictures reminds me of the royal palace. Another view of the attraction. The trees are real. End of the line? – my boarding gate appeared to be the second to the last gate along this wing of the airport. I found this unusual and a bit inconvenient considering I flew on Thai International Airways. International airports would usually provide the more convenient gates for their national airlines. Waiting area for departing passengers as seen by someone descending the stairs. Access to the waiting area is via staircase shown in the photo. By d0ctrine in Airports, Infrastructure on January 16, 2013 .